Home > Economics help blog > economics > How much does the EU cost the UK? How much does the EU cost the UK? The ONS. has produced a useful page, which gives the cost of EU membership, including net flows. These are based on figures from 2014. In 2014, the UK’s official gross payments to the EU amounted to £19.1 billion, but the UK receives an automatic rebate of £4.4 billion. This means £14.7 billion was transferred from the UK to the EU in official payments. Working out an average for 2010-2014, this gives an annual net contribution of £7.1 billion according to European Commission figures. How significant is EU spending? Total UK public sector spending is £798bn in 2014. It says that Norway’s contribution to the EU in 2011 was £106 per capita, compared with the UK’s net contribution of £128 per capita in the same year. Rules and regulations. Many claim that the EU has too many rules, regulations and bureaucracy. If the UK left the EU, we could save on lower levels of bureaucracy. However, to trade with Europe, we may need to maintain, at least some of these regulations. Benefits of Single market. If we start adding costs of bureaucracy, you could make a case to start including benefits which flow from access to single market – inward investments, greater trade, cheaper imports. This becomes very difficult to calculate. Vote Leave argue the EU costs the UK £350m a week. How did they arrive at that figure? They used the gross figure of £17.8bn, or £342m per week. This figure ignores the rebate of £4.4bn which is automatically deducted. It also ignores other flows from EU to UK. (e.g. agricultural subsidies, regional funds, private investment). The figure of £350m a week is misleading in the sense, the UK is not sending £17.8bn to the EU. Also, the net contribution is a better guide to cost. For this you can take ONS net contribution of £9.9bn or The EC of £7.1bn which includes flows to private sector. A percentage of VAT income. The figures used to calculate the UKs contribution were baesed on estimates. 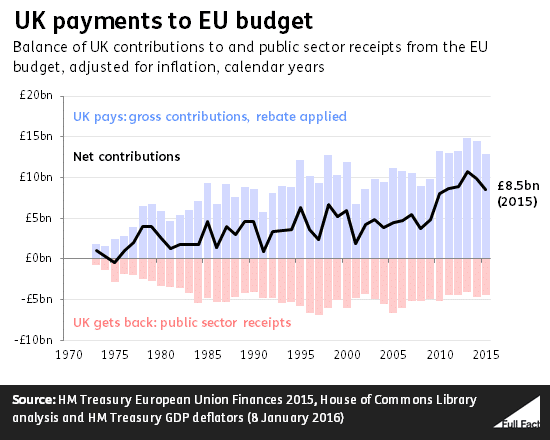 The data on the EUs website show that in 2015 the UKs gross contribution after the rebate was taken into account was €21.409bn around £16.73bn , it received back €7.458bn leaving a net contribution of €13.952bn which at the time was around £11bn.